Prerep: If you haven't setup Single Sign On with D2L, follow our guide here. 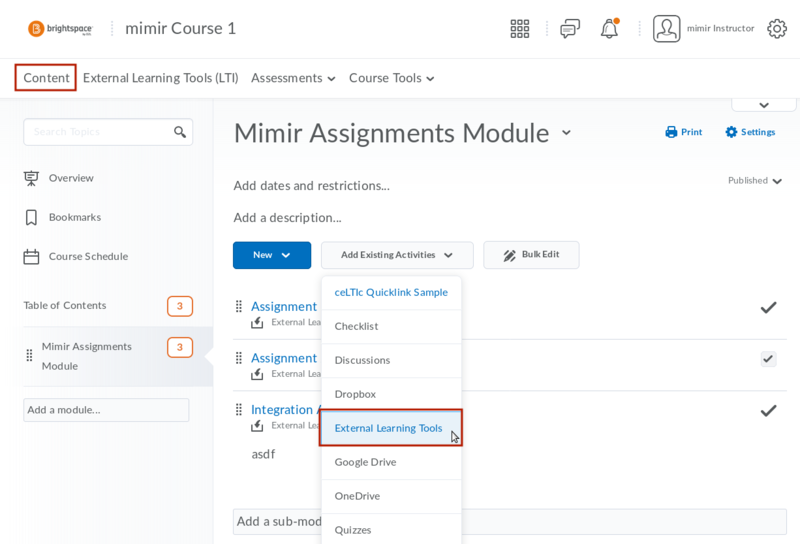 To add the external tool to your D2L module, navigate to "Content" and select the module you want to contain the link to the Mimir Classroom project. 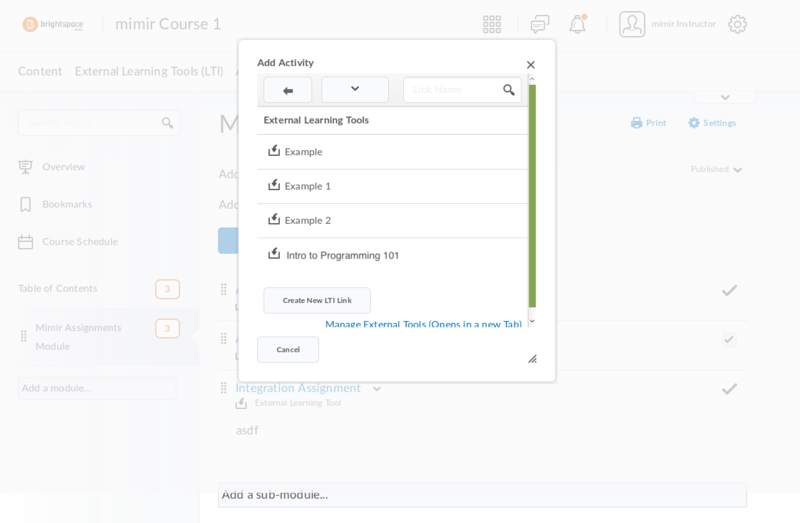 Select "Add Existing Activities" and choose "External Learning Tools"
Select the same external tool as in Step 1 (either Mimir Login or the name of the course you initially linked). Once you have added it, select "Edit Properties In-Place" from the dropdown/down-facing arrow of the external tool you just added and ensure that the check box to open as an external resource is checked. In order for the grades to appear in D2L, the external resource should contain a grade item. From the same list within your module, select "View Topic" from the dropdown/down-facing arrow; this will open a Mimir tab which you can disregard. Under Activity Details, select (+) to add a new assessment - this will add a new grade item. 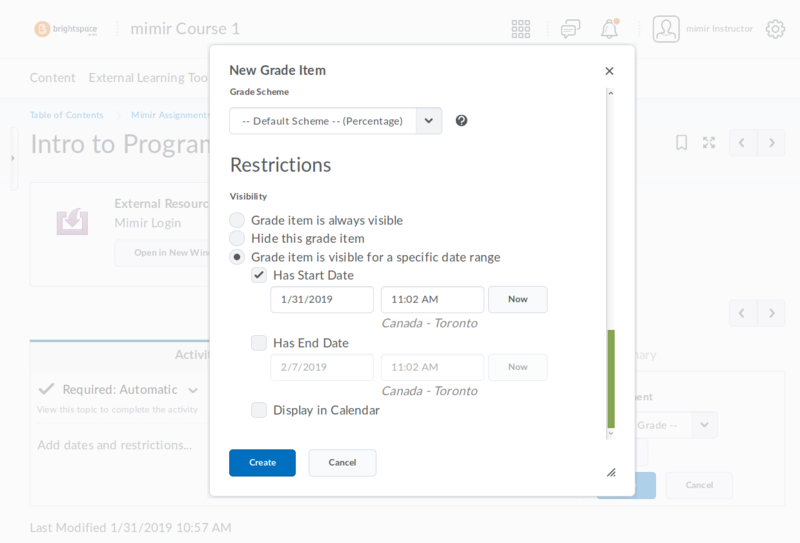 We recommend setting the visibility restrictions to either always visible or to match the due date to your Mimir Classroom's project/assignment's due date taking into account late days and extensions so your students can still access the coursework from D2L. 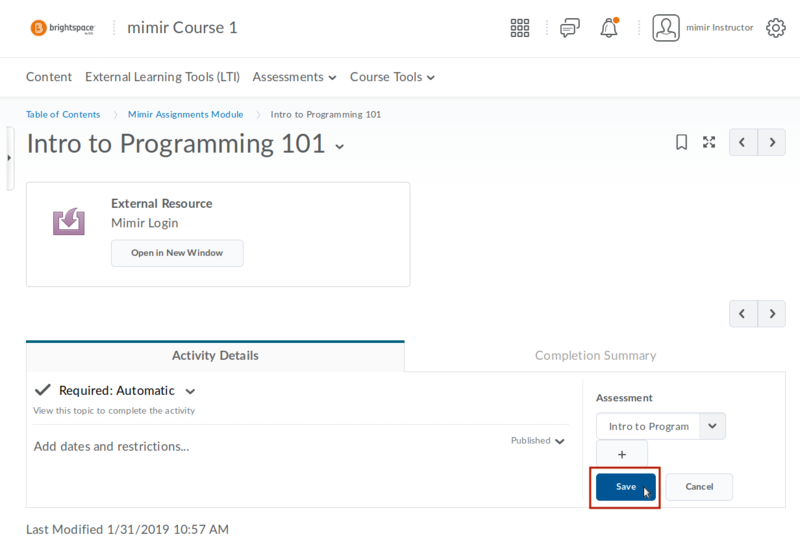 Setup any other properties for the grade item; Mimir Classroom sends the grade as a percentage so it will be a percentage of the total points you assign in D2L. Once you hit create and you're back on the Activity Details, make sure you click save under the selected grade item, the grade will not be automatically saved. Go back to the module and click on the external link (i.e. the title) you added to this module. 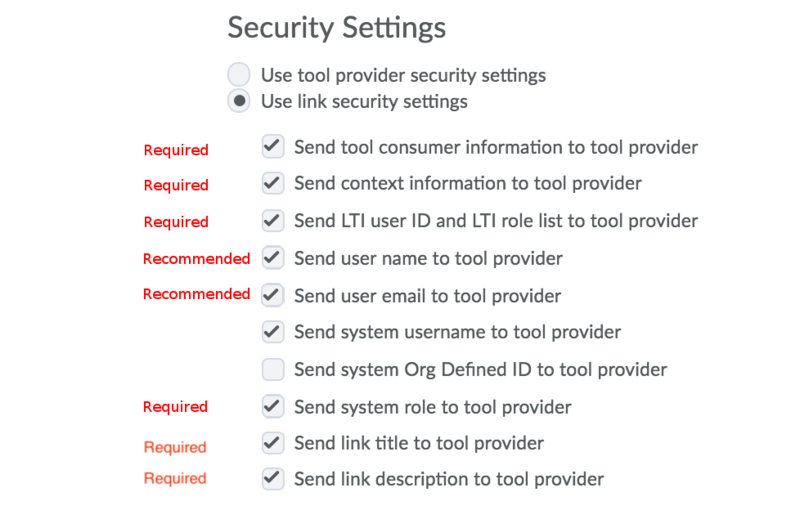 Note: if you see an LTI registration modal on the Mimir Classroom page, follow the prompts to activate and then you'll be back at the next step. To finalize the project/assignment sync process, select the corresponding assignment - it will be automatically selected if the names match. Only coursework in draft or schedule with no submissions will be displayed in the dropdown menu. After you click "continue" you will be redirected to your assignment/project to finish scheduling. Opening the external resouerce in D2L will prompt them to "Open in a New Window" and sync up is done. This will automatically create an account in Mimir Classroom if they don't already have one. When you're done grading, you can select students and release the grades. Once the grades are released, they will be automatically synced and updated to D2L. You will see a warning on the release & sync grades modal if your students have missed this step. 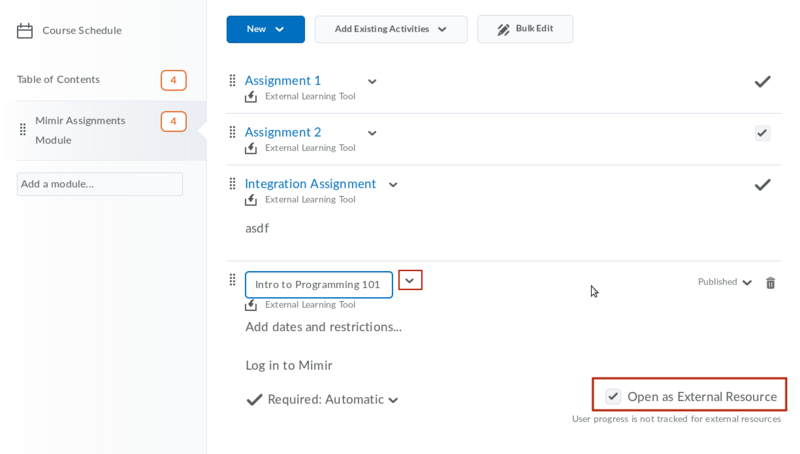 You can still enter their grade manually in D2L but if you'd like to do this through Mimir Classroom, your students need to open the project/assignment through the link in the corresponding assignment in D2L.